I love a good roller coaster. My family used to travel the country every summer scouring every Six Flags for the biggest and best thrill rides in America. If I’ve learned one thing from the hundreds of coasters I’ve had the chance to ride, it’s this: You’re not supposed to be comfortable on a roller coaster. If you’re comfortable on a roller coaster it’s not much of a ride. It’s more of a Merry-Go-Round. The fun comes from the fear. 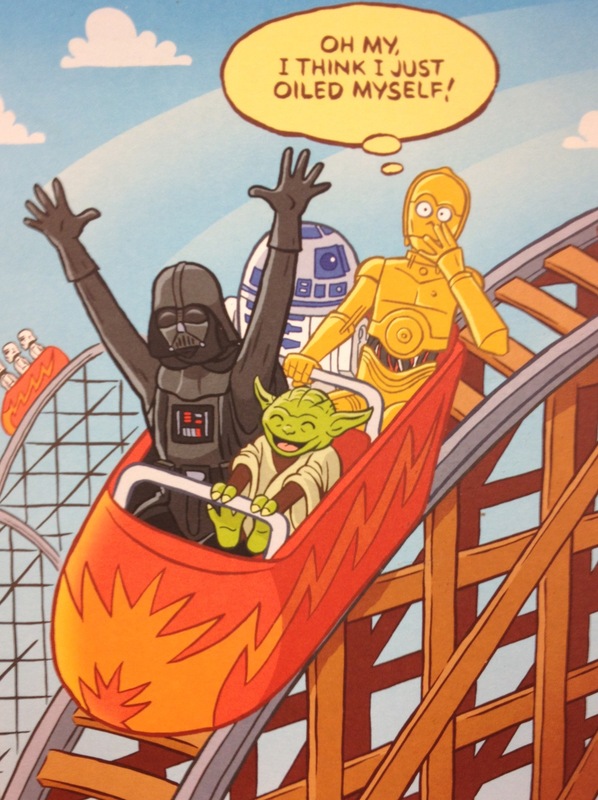 You get excited riding a roller coaster because there’s a chance you might not make it back to the station. As your car climbs the first hill you begin to wonder if the brakes on this thing really work. You start thinking about your exit strategy in case the coaster gets stuck. You wonder why everything sounds like it’s about to fall apart. The climb seems longer than it should. Then you drop down. And then the fun begins. 90 seconds of an unadulterated adrenaline rush. You can hold onto the bar in front of your seat on a coaster. It’s there to make you feel safe. But do you want to know a secret? The safety bar doesn’t really protect you. All it does is keep you from having any real fun. Next time you’re on a roller coaster, let go of the bar. Stick your hands in the air. Trust in the seatbelt and shoulder restraints and the mechanics holding you in. Let your arms wave free in surrender. You’ll have so much more fun. You can do the same in life. You don’t have to hold the bar in front of you so tight. You can let go. One time Jesus took his disciples on an incredible water coaster in the middle of the ocean. The ship tossed and turned like the best White Water ride. All the while Jesus napped in the bottom of the boat. The disciples were confused and terrified. They should have just enjoyed the ride. After all, the God of the universe was in the ship with them. That ship never stood a chance of going down. Of course hindsight is 20/20. It’s hard to fault the disciples when we fall into the same traps. But we ought to learn from their mistakes. Embrace the storms and roller coasters of life. Stop trying to hold on so tight to the safety bar. You’re not in control anyway. Live in surrender and enjoy the ride with God by your side. Going to Six Flags with God means being willing to get on the ride, no matter how tall or scary it looks (there are no height or weight requirements, so no excuses). It means trusting God will carry you through the loops and sidewinding turns. It means letting go of the handlebar and flying your hands in surrender, stopping your futile efforts to control the coaster. Have you ever gone to Six Flags with God, letting go of the safety bar and trusting in Him? Another good one! Interesting analogy, as usual. Maybe you can give some advice on HOW to let go of that handlebar – that is the hard part! Just have a little faith I guess! Too bad I didn’t have any of our good family roller coaster pics to put on here – that would have been a great illustration.